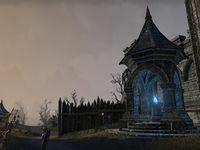 Oldgate is a gate in southern Rivenspire marking the northern end of the pass to Stormhaven. The southern end of the pass is marked by Newgate. 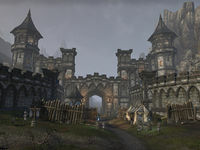 The Shornhelm Guard have set up a camp at the gate following renewed hostilities between the noble houses over control of the city. Oldgate Wayshrine ( Leveled XP) is located right next to the gate, in the camp on the north side. It becomes available as soon as you enter Rivenspire, and its Discovery XP is added to your next Discovery. 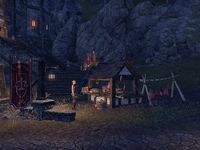 The Meat Hut, a Guild Kiosk run by Fanwyearie, is located on the south side of the gate. This page was last modified on 5 October 2016, at 15:56.